On leaving the airport take the lane for Malaga. That takes you round on a loop onto the E315 and says Almeria and Motril. 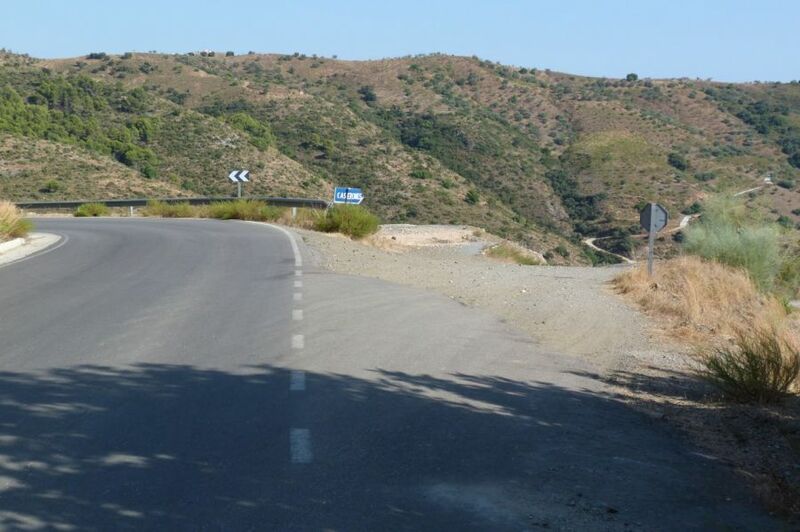 The road splits, right for Sevilla and Cordoba and left for Almeria and Motril. Still take Almeria and Motril. Turn right off the motorway at junction 272 which is signed for Velez Malaga and Casabermeja. At the roundabout take the third exit; for Casabermeja, the A269. Follow this road over two roundabouts and on your right, past a Repsol garage and a Cepsa garage. At km39 turn right which is signed for Canillas de Aceituna, Sedella and Salares. At Y-junction turn left also signed for Canillas de Aceituna, Sedella and Salares. Take the next turning right. This is on a bend and has several different signs but all for Canillas de Aceitunas, Sedella and Salares. At Canillas de Aceituna take the road towards Sedella. It's several km to Sedella from here, through the campo (countryside). At the village of Sedella, keep to the right, skirting round the village on your left. Continue past the cemetery on your left. As you leave the village our track is a few hundred meters on the right, marked with a blue sign "Caserones".